So many different patterns and different makers. 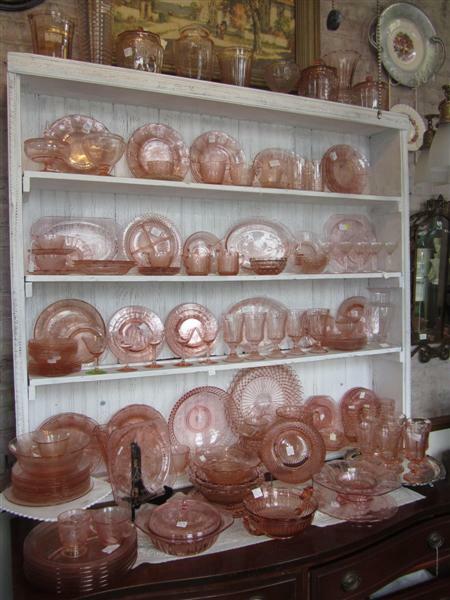 There is quite a story behind depression glass and how it came into existence. In the late 1920’s and 1930’s when the States was in the middle of the Great Depression, companies were trying to get people buying their products. To do so there were several companies, ie: cleaning, grocery stores, department stores, and many more that would give you a “promo” piece when you bought something from them. Being that these were “give-aways” quality was not really of importance. You will notice in the picture that the color of pink varies. There were many different glass companies that made different patterns and pieces. You were unable to buy a whole set of a pattern. You would have to collect them. There became a few patterns that became very popular, American Sweetheart made by MacBeth-Evans, Miss America made by Hocking Glass, and Cherry Blossom made by Jeanette Glass Company are among them. If you are looking for a particular pattern or piece, let us know!